A number of FSILG alumni, students, and staff have been seeking to incorporate planning for FSILGs residences as part of MIT's comprehensive West Campus Planning effort now underway. This effort is gaining traction as we see that FSILGs can add immensely to vitality of a new West Campus hub. What this initiative is . . . . .
What this initiative is not . . . . . HERE is a link to the Dropbox folder with the full Phase 2 Report. FSILG students and their governing groups are important stakeholders in this long term effort. Members of the West Campus Village steering committee met with the Panhellenic Association Exec on April 10 and the Interfraternity Council (IFC) Exec on April 23 to discuss progress. After a short presentation by AILG Board members Steve Baker '84 and Pam Gannon '84, FSILGs interested in locating to the West Campus Village reviewed draft occupancy and governance models. About thirty people, including a few MIT staff, attended and discussed two key draft handouts - a set of 3 FSILG residence models and a draft governance model. As Phase 2 is winding down by this summer, DSL and the AILG now seek to determine the FSILGs who will participate in the next level of detailed planning. Questions and commitments can be addressed to west-village-feedback@mit.edu. The West Campus Village concept continues to make steady progress. The forty or so people at this meeting reviewed and discussed the plan choices outlined by the West Campus Village Taskforce and the MIT Planning Office, as part of the larger overall West Campus revitalization effort. The FSILG stakholders also commented on the proposed management and operations models. Some 40 people attended and the presentation can be found HERE. Here are the notes from the March 5 breakout sessions - 1-bed count & bed mix, 2-cooking & dining, 3-common spaces within each house, 4-other amenities in West Campus, as well as a summary reporting for all four breakout sessions and relevant notes from the Benchmarking report and the Student Design workshop. Several dozen alumni and students from interested FSILGs discussed design concepts with MIT staff on December 4. HERE are the slides from that evening. A follow on session will be scheduled in January. In the photo below, Campus Planning Director Jon Alvarez discusses West Campus sites with the groop on December 4. As part of detailed examination of DSL policy issues, the Division of Student Life Visiting Committee recommended that this program be pursued as part of the overall West Campus Planning effort. The first of what will be regular bimonthly updates on the progress of this initiative was sent to a variety of MIT alumni, students, and staff. HERE is the November update. HERE is a link to the Dropbox folder with the full Phase 1 report. Those FSILGs contemplating a possible move to the West Village should now makes their interest known. West Campus Village Steering Committee Chair Steve DeFalco '83 issued this e-mail to the MIT community inviting interested FSILGs to join in the the next phase of discussions and planning for the West Campus Village. Two students taking 1.472/11.344J (Innovative Project Delivery Methods in the Public and Private Sectors) chose to write a paper on about the West Campus Village plans. The two are Alec Heifetz '16 (Alpha Delta Phi) and Ben Claman '17 (Zeta Psi) and their paper outlined possible project delivery methods for this project going forward. Thanks to them both for this critical thinking. The paper and class presentation are in this Dropblox folder. The most recent activity was the Student Design workshop on Saturday, January 21. This session was attended by 28 students and the purpose was to actually experience the constraints and opportunities offered by a typical West Campus campus site. 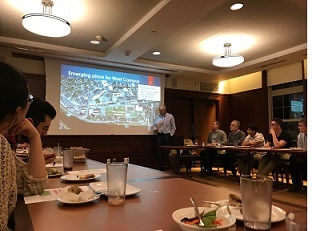 The session was run by two MIT-trained professional architects and also included an update from two members of MIT's Center for New Urbanism who have been involved in developing the West Campus plan principles. The agenda and material are in this Dropbox folder. The folder also includes the notes from the day, as well as the design sketches from each table. People are invited to comment to west-village-feedback@mit.edu. The Benchmarking Working Group delivered their Final Benchmarking Report on January 12. The nine person group interviewed 22 colleges and organizations who have done work on housing for independent living groups. The initial Student Design Working Group was a very productive brainstorming session. HERE is the transcription of the voting on the ideas generated at the workshop. Items highlighted in green generated lots of interest – 4 or more votes. Items highlighted in red were vetoed, meaning someone feels very strongly that the item should not be included in the final plan. In order to get input from the chapters that were not represented at this session, Caitlyn Mason '17 developed a Google form for feedback. The form also allows people to add more elements. As of today, some 108 responses were received and are compiled HERE. - Presentation of June 8, 2016 at the FSILG Village Kickoff event prior to the AILG Annual Dinner. - Presentation to the DSL Visiting Committee in November, 2015 resulted in the endorsement of that group to pursuing this option further. HERE is a link to the work of the West Campus Village Steering Committee and other historical documents from the recent - and distant - past.